I cannot believe it is already December! Christmas music is playing wherever I go, my Facebook feed is filled with delicious recipes and my shopping is not even started! Tell me about it. I am last minute when it comes to Christmas gifts but plan my Christmas dinner ahead of time. I have been sharing my Christmas dinner plans for 2 weeks. 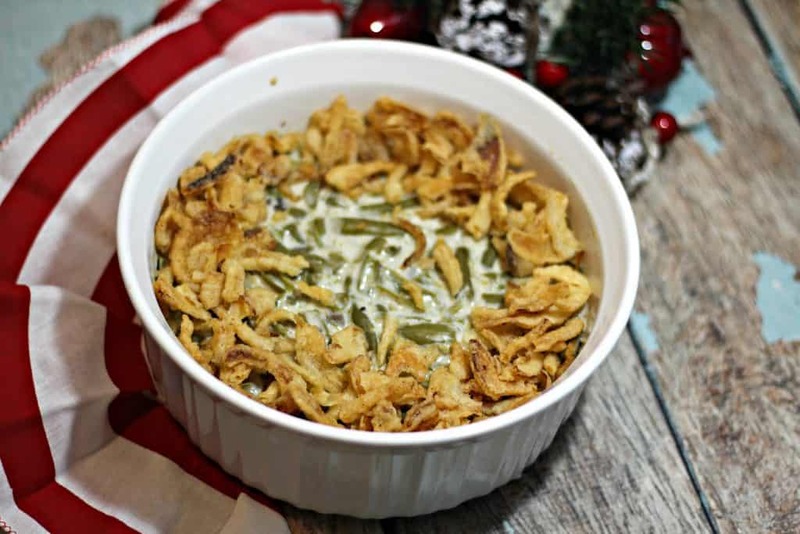 To finish my Christmas dinner in style, I am sharing this delicious green bean casserole. It is a perfect side dish for the honey glazed ham recipe. It is another side dish alternative to those who are not fond of candied sweet potatoes. It is also a great way to serve veggies, with some homemade fried onions. I rarely serve fries, but I make an exception during Christmas time. My kids love fried onions and I want them to eat them veggies. So it’s a great compromise! 1 container of homemade fried french onions. You can use packaged one but I prefer homemade ones. If using fresh string green beans clean the beans and cut the ends off. Place into a pot of hot water and boil the green beans until tender and hot. In another sauce pan , pour in the cream of mushroom and keep on low heat while green beans cook. Combine green beans with cream of mushroom and then pour into a baking dish . Sprinkle the fried onions around the edges. Bake in the oven for 20-25 minutes. As easy as that! This Christmas side is better when served hot. Fries won’t taste great if they are cold so make sure to prepare it at the last minute. You can prepare the ingredients ahead of time and set up the dish. Besides kids might eat all the fries before you get the chance to put them in the dish. Now time for the dessert but you have to wait until next week to get the details! Here is a sneak peak of what it will look like. Have you ever mixed green beans and onion fries? How did you like it? Tell me. I am always looking for good side dishes for Christmas. We celebrate, with a green bean dish with cabbage in it, in our home so I am interested in trying something new. that green bean casserole looks amazing! i will have to try this. Green bean caserole is one of my favorite side dishes to make around the holidays. Thanks for sharing your recipe for it too. 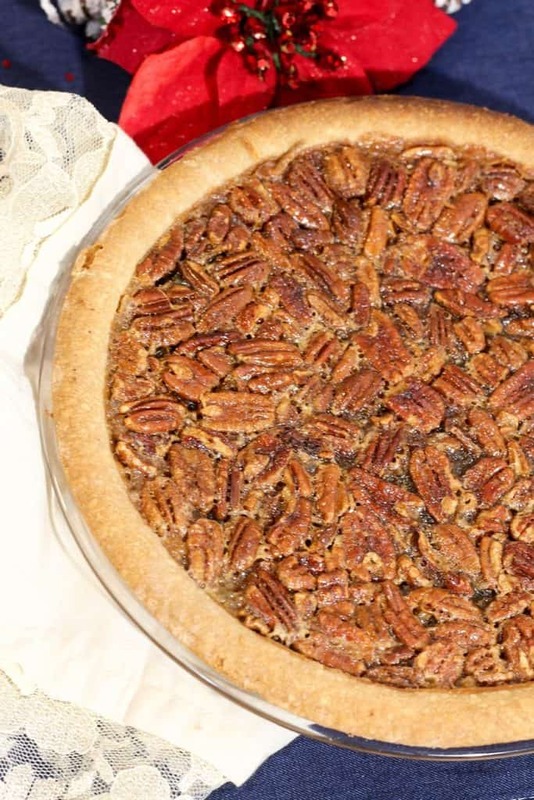 Oh that Pecan pie! My favorite!!! I seriously want a piece now. This is always one of my favorite holiday dishes. I used to make those green beans all the time when I was a younger wife. I’d forgotten about them! This is sort of an essential holiday side dish in our house, lol. I can’t imagine Christmas without it. I always make this every year for Thanksgiving and Christmas. 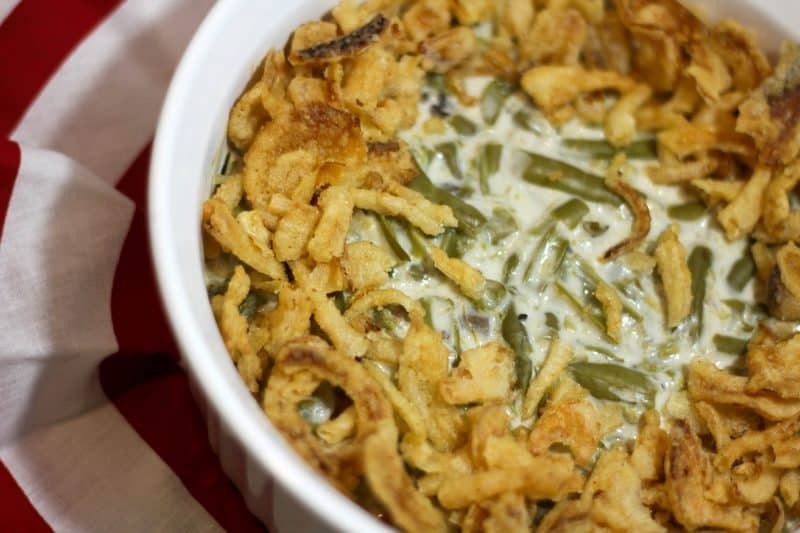 It is so easy to make and everyone loves this Green Bean casserole! Interesting dish! I love green beans and may give this recipe a try!